As previously reported, Mindy Kaling has been working on a followup to her 2011 series of memoir-based essays, Is Everyone Hanging Out Without Me? (And Other Concerns). 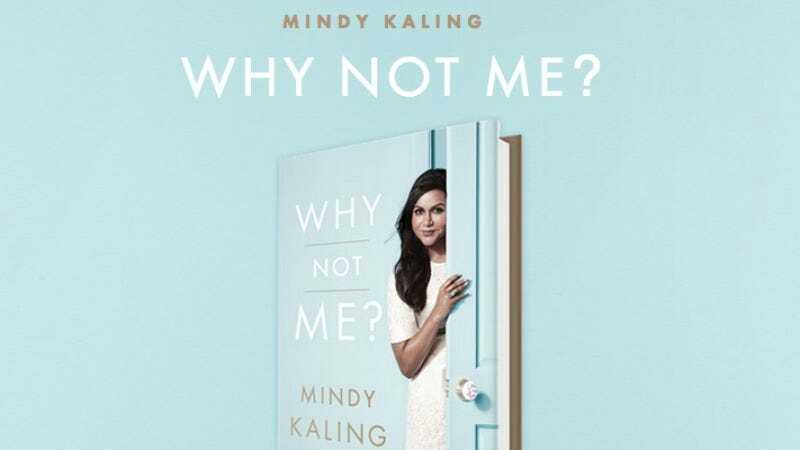 Her new volume, Why Not Me?, now has a release date (and a cover, and another questioning title) with new material from the Mindy Project star. In her first book, Kaling discussed her college life, her early efforts to break into show business, and her days as the first woman in The Office writers’ room. A few years later, Kaling is now established in Hollywood, as the sitcom she created and stars in recently wrapped its third season. So Kaling’s new chapters discuss “How to Look Spectacular: A Starlet’s Confessions” (“Your natural hair color may be appropriate for your skin tone, but this isn’t the land of appropriate–this is Hollywood, baby. Out here, a dark-skinned woman’s traditional hair color is honey blonde.”); “Player,” in which Kaling describes being seduced and dumped by a new L.A. friend (“I had been replaced by a younger model. And now they had matching bangs.”); and “Unlikely Leading Lady,” where she discusses “America’s fixation with the weight of actresses” (“Most women we see on screen are either so thin that they’re walking clavicles or so huge that their only scenes involve them breaking furniture”). Kaling fans can look forward to the book’s release on September 29. With any luck, we’ll find out if The Mindy Project will be back for a fourth season by then.